The hotel's complimentary shuttle takes guests within a 3 mile radius of the hotel and to and from the airport. 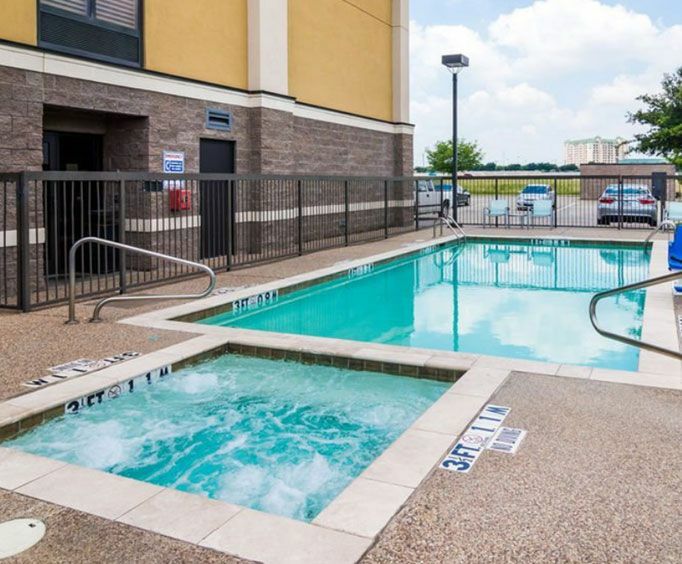 Conveniently located less than two miles from the DFW airport, the Comfort Suites DFW N/Grapevine places you near many of the area's most popular attractions. 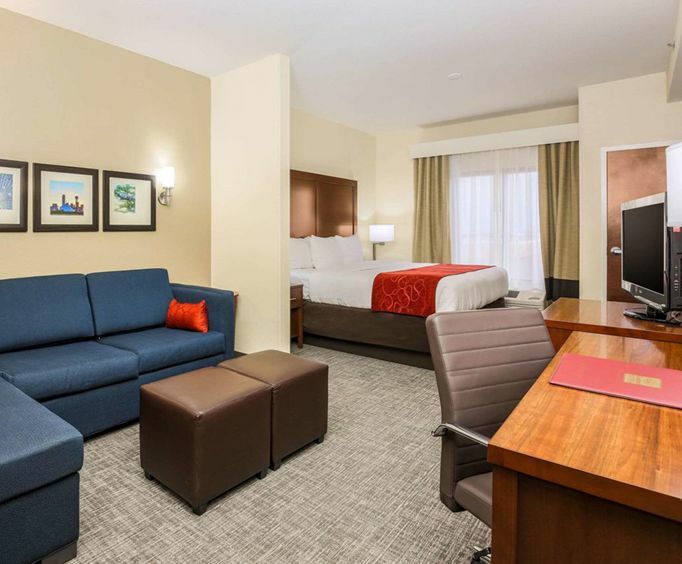 The hotel features a host of amenities, including a fitness center, hot tub, outdoor pool, hot continental breakfast, free daily newspaper and a free shuttle service to and from the airport. This hotel allows you to stay just minutes away from Delaney Vineyards, the Grapevine Opry and Grapevine Lake. Relax knowing that you are minutes from the airport, with the free airport shuttle service taking the hassle out of catching an early flight. Enjoy your complimentary breakfast featuring eggs, bacon, cereals, fruits and yogurt, while you check out the latest headlines in your free copy of USA Today. If your day starts extra early, try a Your Suite Success™ Grab & Go bag, available two hours prior to breakfast. The on-site fitness center makes it easy to work out, while a few laps in the pool, followed by a soothing soak in the hot tub, provides the perfect ending to your day. Upon relaxing in your room, you are sure to enjoy finding a coffee maker, iron, refrigerator and microwave. Further adding to your convenience, the Comfort Suites DFW N/Grapevine offers free local calls and high speed internet. 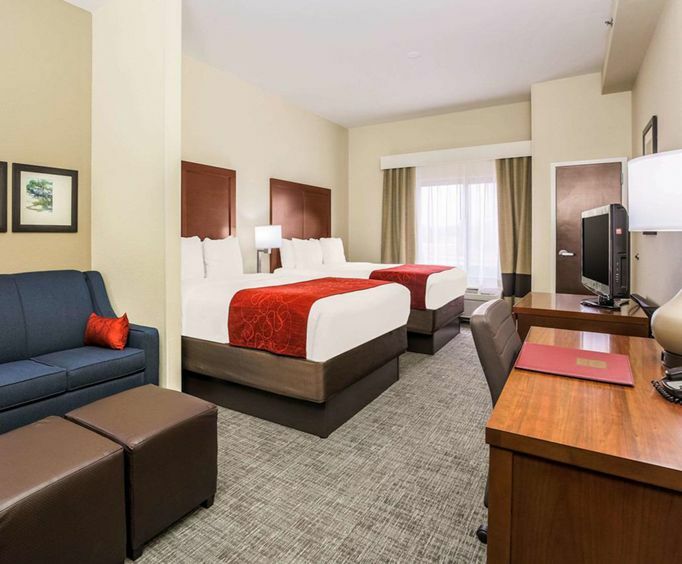 The Grapevine area offers many attractions, including Grapevine Mills shopping mall, which is 0.8 miles from your hotel, as well as Dragon Stadium shopping mall, just 4.7 miles away. Restaurants beckon you to experience the Texas lifestyle, with Federico's, Love & War In Texas and Uncle Buck's Brewery & Steakhouse, all less than a mile from your door.